The Minecraft wolf can be a vicious creature until you tame him; then he’ll fight to the death for you. Bring that same fierce protection to your iPhone 6/5/5s, iPad mini, or Samsung Galaxy S5. 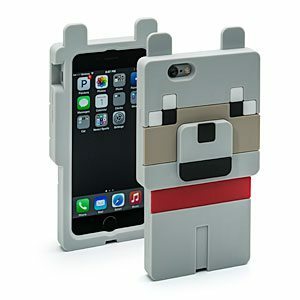 This ThinkGeek exclusive, officially licensed Minecraft Wolf Character Case is made of silicone and has a lip on the front to keep your screen from touching the surface when placed face down. The cases have the following dimensions – iPhone 6: 3.1″ wide x 5.5″ tall x .5″ deep, iPhone 5/5s: 3″ wide x 5.3″ tall x .6″ deep, iPad mini: 6.3″ wide x 8.3″ tall x .6″ deep, Samsung Galaxy S5: 3.6″ wide x 6.0″ tall x .6″ deep. The Minecraft Wolf Character Case may be purchased from ThinkGeek for $19.99 for the phone cases or $24.99 for the iPad mini case. This little guy will protect you and your phone from everything but Creepers (disclaimer: I can not say if this case is impact resistant or provides any protection for your devices). Oh, by the way, ThinkGeek also has Creeper and Pig cases. Please visit their website for more information. After taming the Minecraft wolf, have him protect your iPhone 6/5/5s, iPad mini, or Samsung Galaxy S5 originally appeared on The Gadgeteer on July 25, 2015 at 8:34 am.